"Sweet, Sweet Smile" is a C&W song composed by Otha Young and Juice Newton introduced by the Carpenters on their 1977 album Passage. The track features drummer Ron Tutt who regularly backed Elvis Presley. 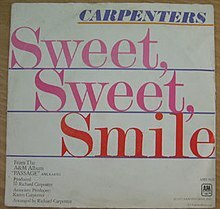 "Sweet, Sweet Smile" fell short of the Top 40 with a #44 peak on the Billboard Hot 100 but gave the Carpenters the sole C&W chart hit of their career rising as high as #8 C&W; on the Billboard Easy Listening chart "Sweet, Sweet Smile" reached number 7. A translation of "Sweet, Sweet Smile": "Der Mann auf einem Seil", served as the B-side of Wencke Myhre's 1978 German hit "Lass mein Knie, Joe" ("It's a Heartache") (#16). A Finnish rendering: "Sä Oot Niin Kultainen", was recorded by Lea Laven for her 1978 album Aamulla rakkaani näin. In 2011, Juice Newton released her own, newly recorded version of "Sweet, Sweet Smile" as a bonus track on her The Ultimate Hits Collection album. ^ "Item Display - RPM - Library and Archives Canada". Collectionscanada.gc.ca. 1978-04-15. Retrieved 2019-02-15.